Ever wanted just a small amount of a spice or food, but had to buy 250 g or even more? If this applies to you, then Kakulas Sister is the place to go. Here you can buy the smallest amounts of most foods/spices all of which are sold in bulk. As well as this they have groceries, both imported and local. Their range is TREMENDOUS and by far the biggest I have seen in Perth. It is an "unassuming" shop, hard to negotiate, with small isles and stock of so many items, it is mind boggling! They have every conceivable nut, in various forms. Their deli department puts many of the larger supermarkets "to shame", with a range of European meats, dried fish, and olives. No longer do you have to buy a piece of cheese that is way too large for what you want - their range of cheese is second to none, with common ones like Cheddar ranging to exclusive French camembert and of course many Australian cheeses. Their range of supermarket grocery items is also excellent and here you can find those elusive foods that the larger stores do not carry as well as your everyday groceries. Dried fruits, Indian, Asian, Italian and many more countries are featured as well as a range of organic as well as gluten free foods. And the sweet tooth does not miss out at Kakulas Sister either -there is a range of loose chocolate including several different cooking chocolates, chocolate covered coffee beans, and many more. Many of the spices are displayed in the large bags they come in and they provide large scoops to get these out of here. Sometimes this is a problem as the bags are large and when quite empty you have to bend right down to get to the item. Well worth a visit, at Kakulas Sister you can buy any spice you could possibly want for your cooking needs, and from all areas of the globe/many nationalities. They also have several freezers of some unusual items, as well as larger quantities of rice and some tinned items. Much cheaper than the supermarkets, and particularly seeing you do not have to throw out, and can always have fresh herbs and spices, this shop is well worth a visit. Open from Monday to Saturday there is parking outside, and it is situated at the Nollamara Shopping Centre, 90 Hillsborough Drive. 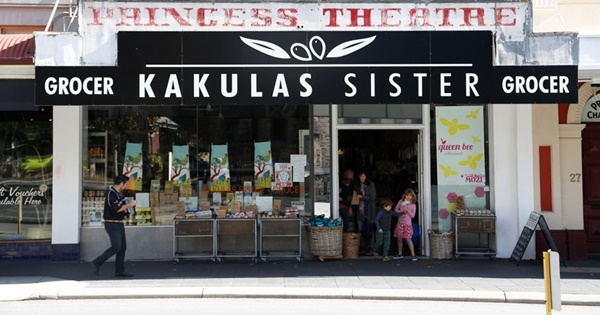 Don't forget Kakulas Sister in Market St Fremantle and Kakulas Brothers in Northbridge! This is a 'must see' for international visitors! Our overseas guests have all been raving about this 'Retro' experience - a true tourist attraction not to be missed .